Notts County owner and chairman Alan Hardy says he has accepted an offer to buy the struggling League Two club just 48 hours before they play the Cobblers at Meadow Lane. The Magpies have endured a troubled campaign on and off the pitch and currently sit 23rd in League Two, above only rock-bottom Macclesfield Town and behind Yeovil Town on goal difference with six games to go. I am delighted that we are now at an advanced stage with people who I am confident have Notts County’s best interests at heart. 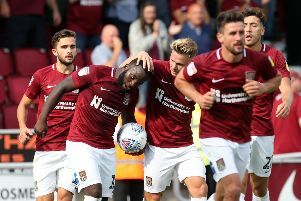 With Northampton due in town for a massive game on Saturday, there also remains significant off-field concerns at Notts County with the club due in court next Wednesday after being issued a winding-up petition by HM Revenue and Customs. Hardy’s interior design company Paragon Interiors went into administration in February but he has insisted their financial problems would not affect the club. Speaking to the club website on Thursday, he revealed a takeover is close. “I am pleased to confirm I have accepted an offer to purchase Notts County Football Club from a very credible party, who is now undertaking due diligence,” he said. “I am delighted that we are now at an advanced stage with people who I am confident have Notts County’s best interests at heart. Recent reports have suggested Notts County’s players and staff might not be paid this month but Hardy, who bought the club in January 2017, played down those concerns in his statement on the club website. He added: “The money for April’s wages has already been transferred to the bank for payment.